Is it just me, or is it just really irritating when people start using jargon that's a load of cobblers? One of the things I have loved about BPO is that the IT evangelists have always steered clear of the topic by a county-mile, because they really don't understand it. When I was an analyst covering BPO in the traditional research world, I was fortunate enough to be left alone to get on with my craft, because there were very few analysts who could tackle anything that wasn't centered on a piece of software, hardware or communications equipment. To them, BPO is the unsexy grunt work that has to support uncool things like actual business processes. Then along comes the Cloud, and a few ambitious souls from the IT world have dared to mention that mysterious "BPO" word in tandem with their wonderful, nebulous, ill-defined, confusing world of Cloud Computing. Yes, some IT knuckleheads are starting to use phrases like "Cloud BPO players" and "FAO in the Cloud", or just plain "Our Cloud BPO strategy". They've been dying to use the BPO term for years - and now they've seized their chance. Oh my. Sadly for them, "Cloud BPO" is, simply put, really a load of nonsense in today's environment. The core fulcrum processes of BPO are the toughest to move into the Cloud, and only the small-to-medium business sector is going to enjoy any modicum of success of moving genuine "BPO" processes, such as finance and HR, into the Cloud in the near-term. And this is mainly with very standardized and straightforward Internet-hosted apps (i.e. simple interface, no integration requirements), as opposed to genuine Cloud-enabled ERP apps that leverage IaaS/PaaS/SaaS architecture. At HfS, we have been at pains to dissect the potential of business processes that can be provisioned by a BPO provider, where its underpinning software and hosted infrastructure are "in the Cloud". And we've gone to even further pains to differentiate between Internet-hosted and genuine Cloud apps. We've even coined the term "Cloud Business Services", because it's simply more relevant to early-stage client needs to move processes and apps into the Cloud, and has a tight definition as to what a Cloud Business Service actually is. Core BPO functions, such a finance and HR, are typically serviced by creaking legacy software that is poorly integrated (if at all), or simply embedded into a complex ERP architecture that’s wrenched into back-end systems and databases. Most firms today would have to transition completely onto entirely new Cloud-enabled platforms before they could even consider outsourcing the related processes to a third-party in a "Cloud BPO" model. It's generally a lot easier with apps that are either already "in the Cloud", or where it's simply more desirable to move quickly onto a standard Cloud model, for example Salesforce.com. 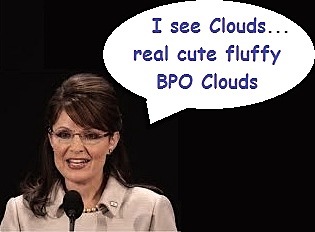 But that's not "Cloud BPO" - that's really just "Cloud". It’s just not going to happen anytime soon - the ROI's not there and the legacy ERP firms aren't chomping at the bit to derail their license models that have served them so profitably for so many years. Yes, they can outsource their SAP support to an ITO and have them process their paychecks and invoices as part of the contract, but that’s not “Cloud BPO”. That’s "bundled BPO", or possibly “Platform BPO” (which doesn’t, quite frankly, mean a hell of a lot either). I'm not trying to be a merchant of doom here, and we do passionately believe in the future potential of the Cloud - as do the vast majority of today's business and IT executives. However, it's time to move away from stupid jargon that's designed to do little more than sound like puff. We are seeing the early beginnings of true "Cloud services / BPO" partnerships around core ERP processes, for example Genpact and Netsuite's early efforts to offer "F&A BPO in the Cloud" for medium-sized business. We're also seeing encouraging advancements that both Accenture and IBM are working on, to offer HRO on Workday, which (ahem) could be the true beginnings of "HRO in the Cloud". But we're miles away from these offerings being widely adopted, so let's stick to reality and refer to these services as business services that have elements of Cloud delivery potential. Or just simply "Cloud Business Services". Anyhow, enough of my little jargon rant – hopefully you’ll join me, Euan, Prof. Leslie Willcocks and Jimmy Harris for a little chat about Cloud Business Services this coming Thursday – just sign up here. Hey, it's free, what more do you want? This is an excellent post - and made me laugh! Yes, you are right to highlight some of the buzz phrases doing the rounds. I think the whole concept of cloud is confusing the industry and people just keep trying to add new buzz to confuse the existing buzz, if that isn't already confusing enough. You make an excellent argument that "cloud BPO" does not make much sense at all in today's market. CLOUD: Vapourware that hasn't yet evaporated. Seriously though, I attended a Fujitsu roundtable lunch around business readiness for utilisation of "cloud" based services and the overwhelming view of the clients was that the best thing the IT Services providers can do with "Cloud" is drop the label and call it something that relates to what it is. I was at a training session yesterday, when one of the participants asked about the emerging "Cloud BPO" to which I sheepishly grinned and said frankly I have no clue what that means or stands for. Thankfully one is not alone. This post is going to be shared far and wide. 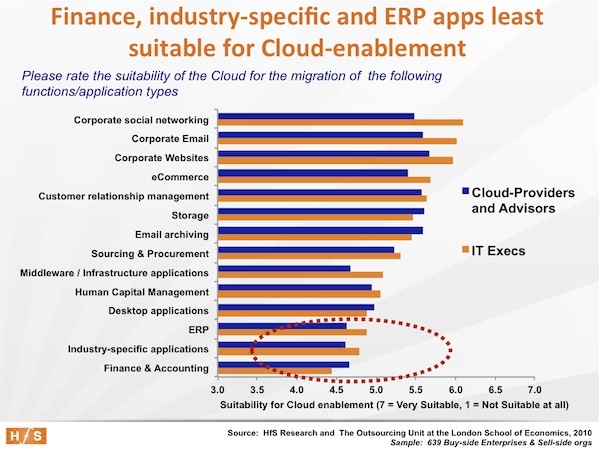 Spot on in terms of Cloud relevance for BPO.A reaction from SAP and Oracle I am sure will occur at some point,but in my mind even this will not significantly change the classic BPO delivery model. Phil I love posts squashing 'jargon'. Keep them coming. They help seperate the grain from the chaff! Your skepticism about "Cloud BPO" is well-justified given the sheer amount of meaningless jargon and obfuscatory language that gets bandied around. That said, it's unfair to tar everyone with the same brush. I assure you, Cloud BPO or process-in-a-cloud is not just outsourcing SAP support to an ITO and have them process their paychecks and invoices as part of the contract. The clumsily named Platform BPO offering actually entails migrating the client from the legacy HRO/FAO system to a multi-tenant platform owned by the vendor, using which vendor-staff then run the various processes, a bundling of SaaS and BPO. Almost all the big ITO+BPO vendors now have this offering, with a few live clients. Cap Gemini acquired some Scandinavian vendor in early 2010 for their Procurement-in-the-cloud offering. TCS has partnered SAP to build multi-tenant platforms for HRO and FAO. Infosys has something similar. So it's not all smoke and mirrors after all. Are you ready for&#8230; The HfS Private Cloud Challenge?